As a general rule, small villages would have a set of stocks, whereas pillories were more common in towns and cities. 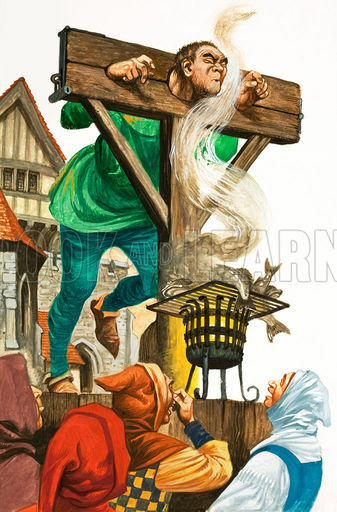 In England, an Act of Parliament was passed in 1405 requiring every town and village to maintain a set of stocks. Larger towns forfeited the right to hold markets unless they were equipped with pillories. A large city like London would have a number of pillories in different locations. Stocks and pillories were used to punish a wide range of minor offences. Drunkenness, prostitution, not attending church; the list is endless. Under more puritanical regimes, even dancing round a maypole. Some of the more regular occupants of stocks and pillories were shopkeepers and market stallholders who cheated their customers. For example, giving short change or measure, or selling poor quality merchandise. Here the punishment was often made to fit the crime. A fishmonger who sold rotten fish would be pilloried with the offending product tied around his neck. 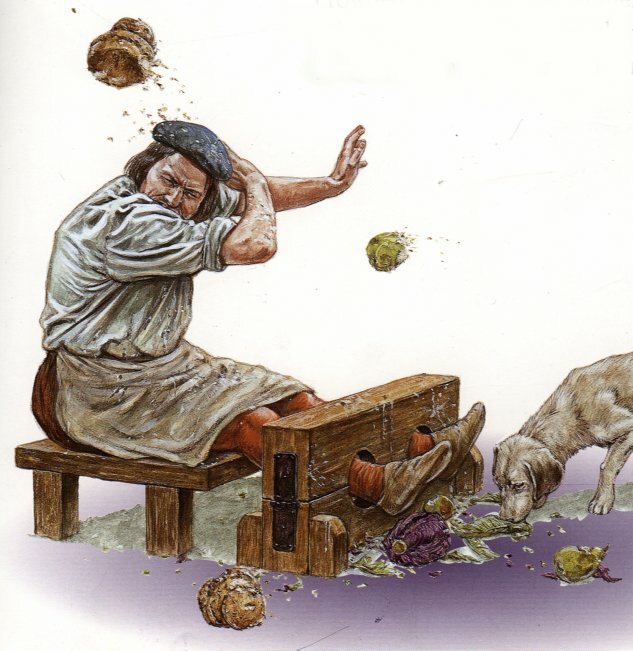 An alewife who watered down her beer would have it poured over her head while she sat in the stocks. 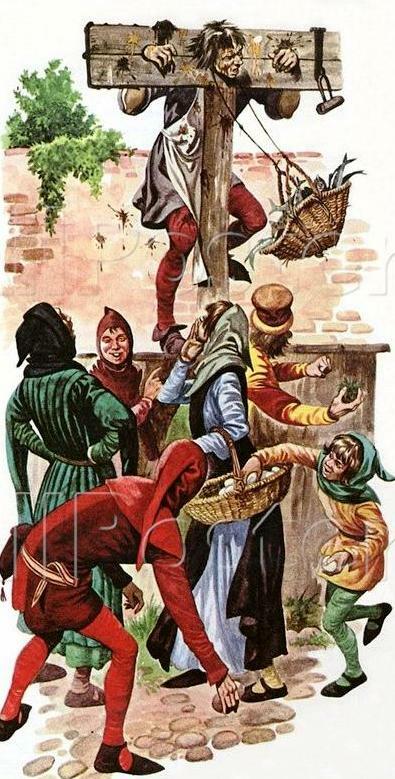 In 1500, a young priest sat in the stocks for getting drunk at a village feast. He was later to become Cardinal Wolsey, Lord Chancellor to King Henry VIII. In 1555, a woman was put in the pillory for beating her child. In 1556, a procuress was pilloried “for the conveying of harlots to citizens, apprentices and servants”. Later in the same year, a child and her mother were pilloried, the one for being a prostitute and the other “for procuring her own child and bringing her to whoredom”. On 3 July 1575, Dorothy Clayton was convicted by the Alderman's Court in London: she "contrary to all honesty and womanhood commonly goes about the City apparelled in man's attire. She has abused her body with sundry persons and lived an incontinent life. On Friday she is to stand in the pillory for two hours in men's apparell and then to be sent to Bridewell until further order". In 1637, John Lilburn, for printing and publishing seditious literature, was sentenced to be whipped through the streets of Westminster and confined to the pillory. In 1704, even the famous author, Daniel Defoe (pictured on the right), was pilloried for writing “The Shortest Way with the Dissenters”. In Sheffield, on 12 February 1790, for drinking in a public-house during the time of service in the church, nine men were locked in the stocks. In 1810, a man and a woman were pilloried together in Driffield for fortune telling. 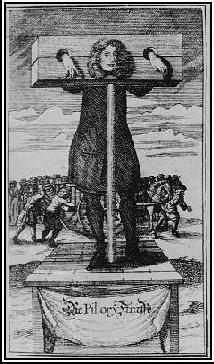 In 1812, a blasphemer was sentenced to the pillory for two hours. This was repeated each month, for eighteen months. In Stockport, on 9 August 1822, two women were set in the stocks for three hours, one for being drunk, the other for “gross and deliberate scandal”. Last modified 14 May 2017.